I love Pinterest! I get so lost going through all the boards and seeing all the wonderful ideas and recipes. I pin and pin and pin. Then I realized, "What good is all this pinning unless I'm ACTUALLY going to try it?" So I have been trying them out. This post is about one of the best money savers I have found. I like fresh produce. I buy a great deal of fresh produce. I put it in the fridge and then a week later throw most of it away. We eat some but just can't seem to eat it all before it gets wilted or spoiled. See that pretty salad? That salad is crisp and Oh so yummy! 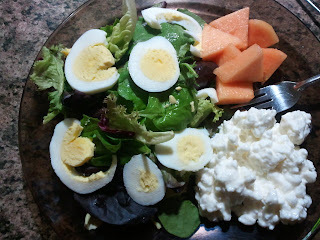 That salad is also three weeks old! Yes, I said THREE weeks old. It came from a bag with premixed spring greens in it. You know, those bags you buy that if you don't eat right away get slimy and disgusting after just a few days? Want to know my secret? A vacuum sealer and a canning jar. Yep, that's it. Well, it's not really my secret but a tip I found on Pinterest that I actually used. I suppose any vacuum sealer with a hose would work, I'm not sure. 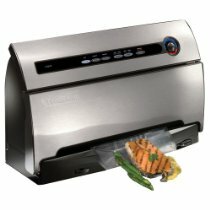 Here is the Food Saver model that I own. Click HERE for more information. My Food Saver does so much! I even pack clothes into bags and vacuum the air out to ship them. I vacuum seal dried beans, pasta, salt, sugar and whatever dry product you can think of in jars to make them last longer. In order to do that I had to buy a lid sealer. Click HERE for more information on them. I will discuss vacuum sealing dry products more later. Now, let me tell you another great thing about vacuum sealing my produce into jars. I eat more of them! Since everything is already prepared once I put them into a jar it is easier to grab a jar of salad and eat it rather than baking up some sweet high calorie goodie. (I still do, just not as often.) I love fresh fruit and veggies but when I am hungry I hate having to take the time to prepare everything. This way I spend an hour or so preparing a week or two worth of salad and fruit and it satisfies my hunger craving almost instantly. Now we are saving money AND eating healthier!